That is an awesome looking car! I can just imagine what 4 engines cranking out 160HP each could do. 640HP!!!!! I enjoyed this post and the one about Who Killed the Electric Car. My opinion is that CARB really dropped the ball. They had the opportunity to take a strong stance and force the automakers into building electric vehicles, but they just caved once they felt the pressure. This is one case where the crazy California’s could have made a real difference. If BMW can build these prototypes, why can’t they put them into production? 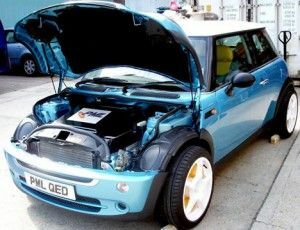 I love my Mini, and an electric one would be awesome. Small car with no need for gas, who could ask for anything better?